Elastic cartilage or yellow cartilage is a type of cartilage present in the outer ear, Eustachian tube and epiglottis. It contains elastic fiber networks and collagen type II fibers. The principal protein is elastin. 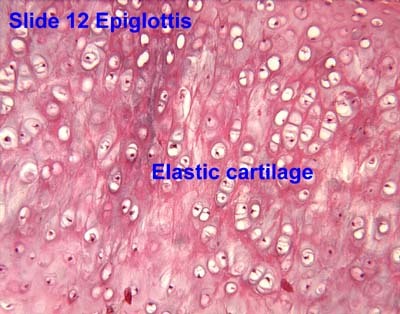 Elastic cartilage is histologically similar to hyaline cartilage but contains many yellow elastic fibers lying in a solid matrix. These fibers form bundles that appear dark under a microscope. These fibers give elastic cartilage great flexibility so that it is able to withstand repeated bending. The chondrocytes lie between the fibres. It is found in the epiglottis (part of the larynx), the pinnae (the external ear flaps of many mammals). Elastin fibers stain dark purple/black with Verhoeff's stain. ^ "Elastic cartilage". Medline Plus/Merriam-Webster Dictionary. Retrieved 1 March 2015. Histology image: 12_02 at the University of Oklahoma Health Sciences Center - "epiglottis"
This page was last edited on 27 November 2018, at 19:34 (UTC).